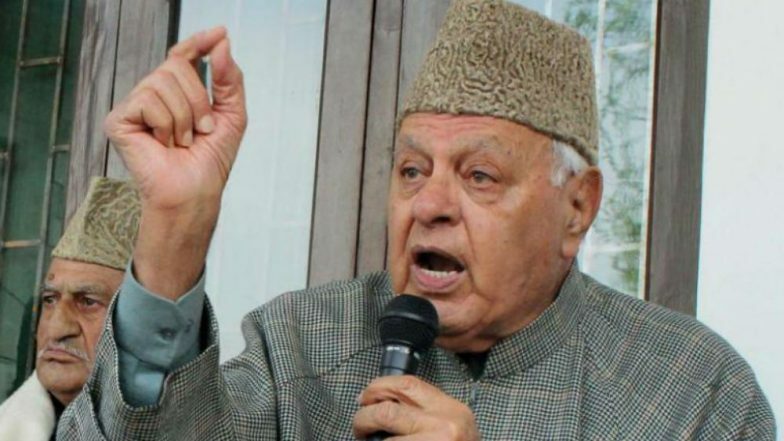 Srinagar, April 15: A day after Prime Minister Narendra Modi accused the Abdullahs and Muftis of trying to break the country, National Conference president Farooq Abdullah Monday retorted back, saying if his family wanted to break India, "there would have been no India". Addressing a poll rally in Kathua district on Sunday, the prime minister had slammed the Abdullahs and Muftis, saying the two families "ruined" three generations of Jammu and Kashmir and he will not allow them to "divide" India. The NC leader said it was Modi who was trying to break the country, but he will not succeed. "Our party fights for the rights of all the people – be it Muslims, Hindus, Sikhs, Christians or Buddhists – and we will continue to fight. Even if Modi tries his best, he will not be able to break India. I want to tell him from here today that you will break, but India will not. You accuse the Abdullahs of trying to break India, if we wanted to break India, there would have been no India then," he said. Article 370 Row: Rajnath Singh Faces Off With Farooq Abdullah, Says 'No Option But to Abolish Article 370 & 35A'. Addressing a workers' rally near the city centre here, the former chief minister said Modi should remember that it was him (Abdullah) who held the country's flag when no one wanted to fight elections in the state in 1996. "Modi should remember that in 1996 when no was ready (for elections), I was the one who went ahead even as my colleagues said we should not contest. But I wanted the people to get rid of the difficulties they were facing...I held this flag and went ahead at that difficult time. You (Modi) should never forget that. There was no one here then, but now you scream," he said. Farooq Abdullah Files Nomination From Srinagar Parliamentary Seat For 2019 Lok Sabha Elections. Referring to Union Home Minister Rajnath Singh's statement that the Centre would make a stronger sedition law, Abdullah said "we will see what you will do" but Modi and the BJP cannot win the hearts of Kashmiris. "You cannot win our hearts. Hearts cannot be won by (using) pellet guns or banning highway or by doing injustice. You say we are not loyal, par agar hum wafadar nahin, tum bhi toa dildar nahin (if we are not loyal, you are also not large-hearted). You say we are your atoot-ang (integral part), how are we the integral part? Where? This is a lie. If we are your integral part, then do justice with us," he said. The former Union minister said Modi and BJP president Amit Shah were "destroying" the country and challenged them to hold an election rally in Kashmir. "Where does he (Modi) address a rally? In Kathua, in Akhnoor. He does not address Muslims in Kashmir because he knows that he has betrayed them. You (Modi) did not raise your voice when the Indian Muslim, who did not go to Pakistan and accepted India, was attacked by your people. Were they not Indians? Had they not spilled their blood for India? Referring to the post-poll scenario of the 2014 assembly elections when no party got a majority in the state, Abdullah said some people from the BJP had visited him in a hospital where he was undergoing treatment and wanted the NC to ally with the saffron party. "But, I told them that I was in hospital and had nothing to do with it. I am happy that Omar Abdullah did not join those people whose hands are drenched with the blood of Muslims," he said. "I want to tell Modi that Farooq Abdullah will not support you till his death. Do whatever you want, but you cannot buy our faith", he added. The NC president asked people to be cautious as the BJP would try to lure them with money. "They will come to you with money. They have about Rs 30,000 crore from Rafale deal," he said, asking people to be united and vote for the NC. Addressing the rally, party's vice president Omar Abdullah said during this election, the people of Jammu and Kashmir have come to know about the challenges and conspiracies that the state faces. The NC vice-president, while referring to Modi's Kathua speech on Sunday, said his party was not like those who say one thing before the polls and another afterwards. "The speech you (Modi) made yesterday in which you said that you want to rid the state of the two dynasties, I remember you made the same speech in 2014. But, then what did you do in January 2015? You embraced one of the two dynasties. You made two chief ministers from that dynasty. So, should I be answerable or you? We do not make false promises," he said referring to the PDP-BJP alliance in the state.